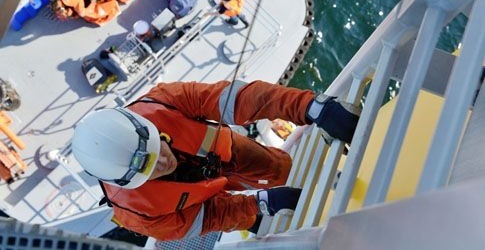 Early in 2015 the UK Health & Safety Executive (HSE) wrote to offshore wind industry stakeholders clarifying their position on the transfer of personnel from crew transfer vessels to offshore fixed assets in wind farms, with regards to the UK Work at Height Regulations 2005. The HSE’s expectation to achieve legal compliance is that a person is attached to a suitable fall arrest system prior to transferring on to the ladder and will when descending remain attached until transferred back onto the vessel. The G+ Global Offshore Wind Health & Safety Organisation (G+) responded to this letter stating support for this method of transferring personnel, and where member sites are not currently adopting this approach that they would work collectively to support a transition to this arrangement and will also notify the wider industry of this intention. In 2018, the G+ has reviewed the response previously provided on transfer procedures. The G+, or G9 as it was formerly known, historically focussed on the UK and Northern Europe, hence the reference in the letter. The G+ now has a strong drive to be global and would like to make clear that the procedures apply at all member sites across the globe. Following consultation responses received during the review of the G+ Working at Height good practice document it is also worth clarifying that ensuring permanent attachment to the fall arrest system during transfer operations applies for all transfers i.e. from a floating vessel to a fixed structure and the other way around.